Game Troopers, which has emerged as one of the most popular Windows 10 app publishers out there today, has announced its first major update for Imperia Online is on its way. The update is apparently an answer to “long time requests” from players of the game, which is available for Windows 10 Mobile devices exclusively and has not made the jump yet to Windows 10 tablets and PCs. The most appealing feature is the battle simulator. As you know, winning battles in Imperia Online is one of the most important things in the game. We have included an engine that helps players to calculate their battles with precision in order to get real military results. All in all, the battle simulator is a powerful tool that can make the difference between victory and defeat. A truly meaningful feature for both novice and expert players. Game Troopers also noted that players will be rewarded when passing this new tutorial. Of course, Imperia Online’s latest version also includes the same features that players have known and loved since the game’s initial release, including the 20 in-game Xbox Live Achievements you can accomplish in order to boost your Gamerscore. For those of you who haven’t yet experienced Imperia Online, the game is a multiplayer online game (ММО), set in the times before gunpowder was invented. 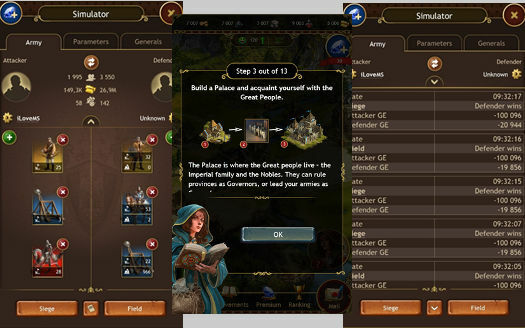 Thousands of players have built empires in the game and you can interact with other players while attempting to crush them with your armies and keeping your own empire safe from attack. Download the new and improved Imperia Online via the QR code and download link below.